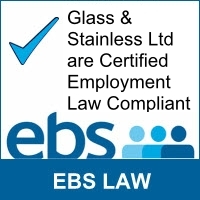 At Glass and Stainless Ltd we are committed to providing high levels of customer service, whilst constantly looking at ways in which we can improve your experience in dealing with us. We have a dedicated team on hand to guide you in your selection of the most suitable products for your project. Designing and installing your project can be left to us, just simply send us your sketches, photographs or technical drawings and we will help you turn your vision into a reality, alternatively if you require supply only we will still work out what you require, without any obligation to you. Our mission is to provide you with premium quality, safe and reliable products. We will advise you based on Industry standards and building regulations, this ensures complete peace of mind. We aim to supply the best quality products within the market place. To ensure this, all products within the Glass & Stainless ranges are manufactured and inspected to meet the highest standards. Where possible we source products from manufacturers who have gained BS EN ISO9001: 2008 accreditation ensuring you benefit from exceptional product quality and service levels. This accreditation guarantees that we conform to stringent quality control procedures, ensuring we get it right first time, every time – so you will too. Quality is a basic business principle for Glass and stainless Ltd.
Quality improvement is the job of every Glass and Stainless employee.